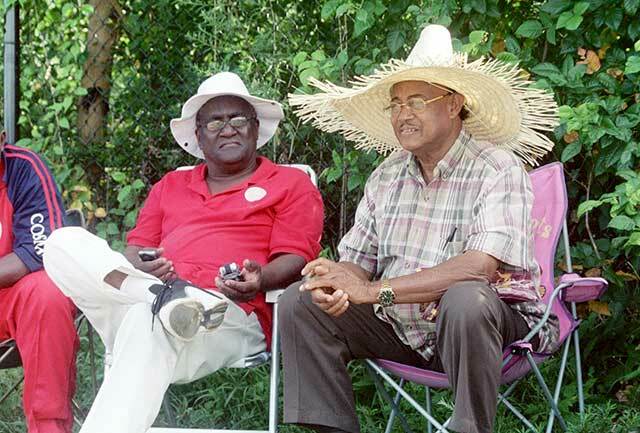 Lloyd Scott (right) with international umpire Steve Bucknor. Lloyd Scott, a jovial, resolute, astute man crammed many a contrasting lives into his 75 years, died on June 5 in New York. 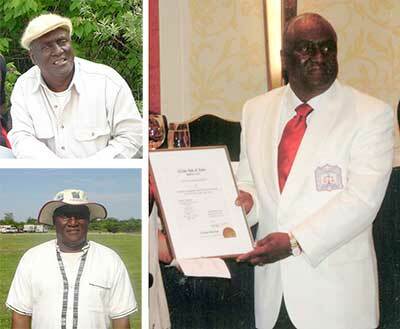 A man with a long record of service to cricket as a player, coach, umpire, but his pride and joy was the birth of the United States of America Cricket Umpires Association in 1992 gave him an identity and ultimately a deserving recognition in the cricket fraternity has passed from the sporting scene. Lloyd George Scott. “Shocked” is a word tossed around with thoughtless abandon these days but the life of Lloyd Scott is one that fully justifies such a description. One of the few fanatical cricket student, consistent and disciplined, if seldom a crowd-pleaser, good enough to amass runs and construct centuries, a dedicated club cricketer, he found far wider acclaim as a highly literate student of cricket whose scholarly analysis of the cricketer’s psyche informed every word he spoke. Behind it all lay a tormented soul, one that was eternally restless if he was not at a cricket ground wherever he was in the world. It is the irrevocable union that fused cricketers with the game, one that has defined them and a pursuit that has consumed their lives since they were teenagers. Few have been more willing to talk about cricket, or any sport, and wrestled as evocatively as Lloyd Scott, and bold enough to challenge the norms. A gentler, more sensitive observer of the game has rarely drawn breath. At a time when judgements are so often harsh and the accent is on serious analysis of techniques and tactics, Lloyd Scott’s cricketing figures were essentially heroes with ‘that West Indies’ bias of flare and flamboyance – even when they were happily presented as flawed characters having fun, they were all the more magnificent for that. And, for too long the standard of cricket in the New York area had remained dormant, and needed some direction. 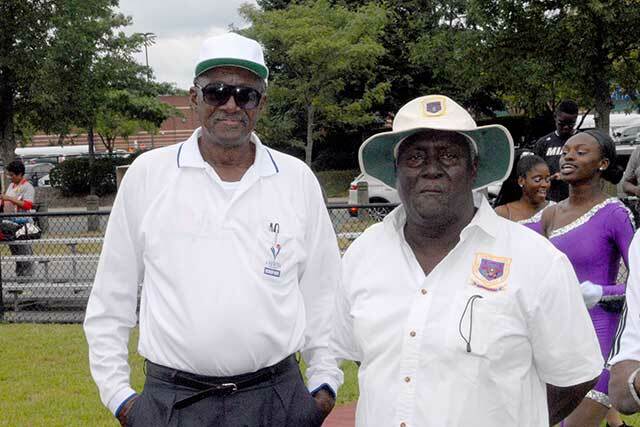 It was 1992 that the vision of a United States of America Cricket Umpires Association (USACUA) was conceived, grew out of the Metropolitan Cricket League, and pioneered by none other that Lloyd Scott. He appeared infatuated in his relentless pursuit to create the Association with a solid foundation underpinned the importance that qualified umpires are needed to uphold discipline, elevate the standard of playing, and change forever the general complexion of the game in the United States. Lloyd Scott pooled resources from near, far and wide while he wrestled with the challenges to get the cricket leagues to recognize the value of the Association. It was a challenge for this “soldier” but Lloyd Scott, as focused as he was, and as judicious a student of the game, he championed his cause, and he did! It was the beginning of a story that will only add volumes of pages to the opening chapter as the years rolled by, and indeed, it remained the most singular achievement in the sport in the United States for the last five decades. This effort, though with its roots in New York, began to gain momentum and grew wings across the length and breadth of the United States. Umpires training sessions revealed the seriousness of this undertaking and Scotty’s vision began to yield impressive rewards. The Association graduated its first class of qualified umpires in 1993 with the then President of West Indies Umpires Association, the late Hon. Chief Justice Rudolph Harper, presenting the certificates to the graduates in Brooklyn. Mr. Scott in his keynote address at the inaugural ceremony with yours truly as the Master of Ceremony stated, “The umpires are the custodians of the game who will play a most important role in the future.” They have the responsibility to ensure that the laws are implemented correctly and respected by all.” The Association now stands proudly graduating umpires on a yearly basis, and at different levels. Some are qualified to officiate at the highest level. The International Cricket Council has demonstrated its approval of the Association by utilizing the services of some of the graduates to officiate in its sponsored tournaments around the world. Today, the USACUA boasts an active membership of over 175, of which 150 have successfully completed the West Indies Cricket Umpire’s examination. While Lloyd Scott’s vision of the USACUA gave cricket in the United States a breath of fresh air, it was not the first. Scotty, as he is called, was born in Manchester, Jamaica. His early interest in cricket was developed at the Jamaica Youth Corps (Cobbla), and further enhanced by former Jamaica cricket coach Dickie Fuller, who visited the Youth Corps to conduct cricket and umpiring seminars. As a young man, Scotty moved from Manchester to Kingston where he continues to develop his cricketing skills by participating in all levels of the game. That included playing at the famous “Oval” on Red Hills Road, as well as with the more renowned Railway and Kensington Cricket Clubs. ‘The Oval” was mostly for fun, played among ‘pick-up’ neighborhood teams. Playing with Railway and Kensington were serious, organized cricket where he played Junior and Senior levels, and also served as club captain at Kensington for five years. It was and still is a place his heart lingers, and a place where many prominent West Indies test cricketers honed their skills, most notably Michael “Mikey” Holding – a Melbourne Cricket Club player – whose name rarely misses a conversation with Scotty. That Michael Holding is now a renowned ambassador of the game and an icon in West Indies cricket holds proud to many, and especially to those who have played the game alongside him. Scotty is proud to have played a role in guidance and encouragement in Mikey’s early days. While serving as club captain at Kensington another first was conceived, Scotty was credited with introducing women’s cricket to the club. He served as coach for the women’s team. Under his tutelage, the Kensington ladies’ team won the Jamaica national ladies championship for two consecutive years. Some members of that team went on to represent Jamaica and the West Indies. Scotty’s achievements did not stop there; it followed him across the seas to the United States where he pinned the United States on the map with the formation of USACUA recognized as an internationally sanctioned umpire association. Lloyd Scott has represented the USACUA at the International Cricket Conference (ICC) sanctioned tournaments in Kenya and India and traveled as an observer to Malaysia and Canada. Perhaps his crowning achievement came in 1999 when the USACUA hosted the West Indies Cricket Umpires’ biennial convention in the United States. It marked the first time the West Indies Cricket Umpires’ biennial was held outside the Caribbean. Conversely, in his era as an umpire he was never short of an opinion. Scotty would have liked to see ICC sanctioned test matches be rotated to include the third umpire. It is his feeling that the two umpires should not stand for all five days of a test match. Apart from the physical requirements of the job, the mental alertness is also challenged over the five-day period. He points out that players can leave the field for one reason or the other, but an umpire does so only in emergencies. And since most umpires at the international level are approximately 50 years of age or older, umpires should be rotated on a daily basis over the five day test match. It is a topic he loves to debate. And if for some reason one so choses to engage him at a cricket, be prepared for a lengthy conversation, and his many stories to make his point, notwithstanding a few trappings minced into the conversation, perhaps for the entire duration of the cricket match. His judgements were based not merely on the wholesome understanding of the game but on a wider understanding of society, history and human behavior, and his ability to connect the dots. Like all good cricketers, he was observant, and deeply affected by the failings of the leagues and clubs. His idiosyncrasies often collide, even as he grappled with his own complexity which appeared at greater than the sum of its parts. He was frank, sometimes too frank, he was bold sometimes too much, and at times quite sensitive for a person who never held back from expressing his views on the affairs of the game. It was with that love, where many cricketers flatter to deceive, Scotty runs deep. He was the ‘link’ man binding players to officials in a manner to be envied, and he was at the helm when the Metropolitan Cricket League was the premier league in the New York cricket world. Pride and differences in opinion have caused plenty of arguments and disagreements. Scotty was often carried away with the success and requisite need of the USACUA that he did so much to build; however, he often found a way to bridge men and their might under one cloud. And when, Scotty resigned after serving as President of the USACUA for over 10 years to concentrate on his business appointments things were never quite the same, his belly grumbles in unison with his tongue, even though, he continues to serve the Association as an Executive member. But Cricket is not all that consumes Scotty; he was, also, President and CEO of Scott’s Plumbing and Heating Company for the better part of 25 years. He was an unapologetic romantic, showering those he spoke about with praise and devotion and, more often than not, a rush of compound adjectives. In his exchanges, sentimentality or nostalgia was qualities to cherish. Scotty has retained into his adult years an almost boylike enthusiasm for cricket and a completely non-envious admiration for its performers; his is the blend of romanticism, relish and sheer delight. A gentleman of not mere surface charm or the easy lightness of confident sociability, he makes sure he fulfils his duties and obligations without drawing attention to himself or making a fuss. The players will miss a friend and officials will be saddened the absence of a colleague, but few were prepared for the end that came so suddenly at a time when he was probably planning a return to the cricket scene. That confident gentleman with his signature wide brimmed cricket hat, in his chair at the cricket ground, holding court, but never missed a ball, is there no more. Scotty was a class act! Above all he was always courteous, constant, and always the same, whatever the circumstances or the company as he always has been – warm, self-deprecating, and concerned about the lives of others and always willing to offer help and advice. As ever, he made a point to inquire of my brother, Ashmul Ali, whom he admire and often talked about as one of ‘his’ batsman, and the Family and friendship, you sense, are central to his life and his values; the quality of a caring man. His affiliation with Cosmos Cricket Club over the years has been both an inspiration and an excellent source of camaraderie to the club, especially on the many tours, and most notably, our first international tour, the one he organized to Oxfordshire, England in 1990, where his wealth of experience as a manager, cricketer and a gentleman added a new dimension to the cohesiveness of the club. His stewardship will always remain at the helm and Cosmos felt privileged to have had him in their family. Lloyd Scott (left), and Roy Sweeney. And, for a confident, aggressive man who could have written an convincing book on the dubious art of defending an umpire’s poor judgment on and off the cricket field, he was a better, more humble and caring person the second time around, while retaining his sense of humor. His oration could be too florid for some tastes for he was a loveable old rogue when it came to embellishments – it was often joked that in his trips down memory lane Scotty had often inadvertently imagined himself as he dipped into his imaginary shelves of cricket tours, he had an eye for greater truths. You could tell from just one ball bowled or one shot played that he was a cricketer of good ilk. His hard work was driven by the desire to give a full expression of himself, and he did it not with a bat or ball, but dignified in an umpire white coat which gives the game that signature symbolism of a purposeful practitioner. He was a man of substance, morally serious and intellectually curious. For all his understatement, he couldn’t fail to convey those qualities to anyone who watched him properly. He loved life. But life does not allow us to design our departures, and Scotty got another lease on life in 2016 after suffering a cardiac infraction, and thereafter, his battles with illness leant his features an eerie plasticity. His face, which once had a craggy grandeur, began to show signs fragility, and that echo in his voice had lost a few decibels, yet it didn’t slow down. But quite visibly, an illustrious journey was nearing the end. He was tired and frail and lost a major per cent of his heart’s capacity, however, that ‘heart’ of his and his unwavering passion for the game never relent, it just picked him up and got him to the cricket ground for ‘more talk and ‘nuff talk’. But his weakness was bordering on skeletal, and virtually unfamiliar from the sturdy, gregarious character he had been for most of his eventful life. To me and many of my peers who have served the league over the years, there is little doubt that Scotty was one of the Metropolitan Cricket League’s true loyalists; man of many parts, a pioneer, a steadfast character, a cricketer and an official of rare gifts. There is something mystical about his work, as if an attempt was made to draw a line under all that had gone before, but that another force remained to deny it. We shall never know, but behind that affable manner hid inner steel, removed his mask and put a creative mind to rest. By being so spiritually aware of what lay beyond the physical world, he became an irresistible conscience for those of us left behind. The game ignores his teachings, and umpires their duty at their peril. I will miss him. We will miss him. The wisdom, the kindness, the child-like simplicity of his humor, the lack of ego, the rants – yes the rants, and how this and that collide, the high standards, the hard but fair marking, the counsel given and taken, the shared love of so many things that stretch heart and mind. Above them all is friendship. His vision ensured that his fame was less dimmed in old age than that of his peers, some of whom without such a focus, faded from memory. The Umpire finger has been raised! 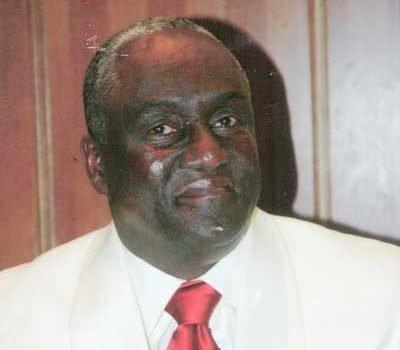 Lloyd George Scott is laid to rest. Farewell to a Pioneer. Farewell to a Player. Salute a Dear Friend. And he joined, in our memory two of the Metropolitan Cricket League stalwarts, the irreplaceable Clement ‘Busta’ Lawrence and incomparable Roy Sweeney.